Limerain can jailbreak iPhone 4 and all other iDevices on iOS 4.1 including previous iOS versions. It is a little buggy for some iDevices but limerain works. Here is a step by step tutorial to jailbreak iOS 4.1 using limerain. Even if limerain doesn't work for you, try greenpois0n. If you want to unlock your iPhone then do NOT use limerain. Dev Team will be releasing PwnageTool that will preserve the baseband while updating the iPhone to iOS 4.1 which is not available in limerain. Before using limerain, you must have a clean install of iOS 4.1 firmware. Check out the limerain tutorial after the jump. I can say that limerain worked for me, on the iPhone 4. We have heard a tons of errors with older devices using limerain. The Chronic Dev Team and the iPhone Dev Team will release greenpois0n and Pwnage Tool very soon. You might want to wait for those. So, the controversial jailbreak, limerain, has had some bad reports and good reports, so far. I decided to give limerain a try for myself. 1) Download limerain (download link below). 2) Plug in your iDevice and launch limerain. 3) Click on “make it ra1n”. 4) Your iDevice will enter recovery mode. 5) Now hold the “Home+Power” button to go into DFU mode. 6) Keep holding the Home button, release the Power button. 7) Now your iDevice is in DFU mode, wait until limerain jailbreaks your iDevice. 8) Now your iDevice is successfully jailbroken. 9) Reboot your iDevice, lauch limerain on your iDevice and select Cydia to install. 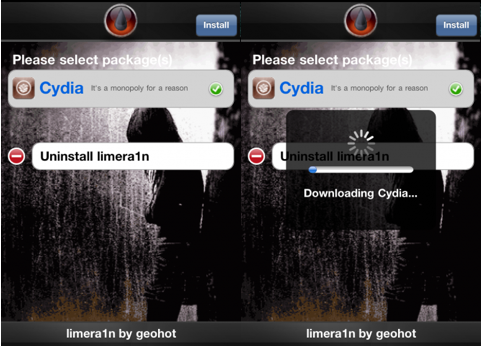 10) After Cydia is installed, you may uninstall limerain. As always, please don’t forget to tell us how limerain goes. Feel free to ask any kind of queries and issues in the comments section below. 1) Go to “Programfiles(x86)/Common Files/Apple/Mobile Device Support”. 2) Save and remove “iTunesMobileDevice2.dll”. 3) Copy and paste “iTunesMobileDevice.dll” Rename and copy to “iTunesMobileDevice2.dll”. Some users are reporting that Cydia doesn't show on their SpringBoard after jailbreaking with limerain. For fixing this issue, restart your iDevice. Note : If limerain doesn’t work for you, you can use greenpois0n (tutorial here). * Beta iOS versions are not supported by limerain. * iPod Touch 2G support coming soon in limerain. * For iPhone 3G, use Redsn0w instead of limerain. * limerain for Mac coming soon. * AppleTV is technically supported by limerain, but there are no apps yet. If you are facing any errors or issues with limerain, follow this guide on limerain FAQs and troubleshooting. Stay tuned to Mod Your Pod for the latest updates and news on limerain jailbreak.